Describing what we do can be a difficult task. To simply say that we are chiropractors doesn’t fully explain our level of care. That would be like a musician stating that they are just a musician. You would have no idea what instrument they use, or what style of music they play, leaving a lot for the imagination to guess or assume. The same can be said for chiropractors. What we’d like to do here is explain a little bit about the particular techniques that we employ. We use a drop table in this practice. Drop tables have individual sections of the table that can pop up slightly and drop down, and stop suddenly when a small amount of force is applied. 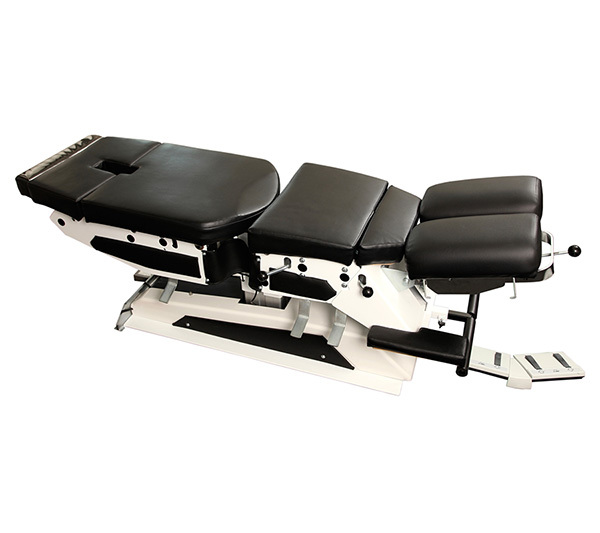 This sudden stop after the drop engages the use of gravity to create some of the force with some of the adjustments that we do, making it feel more gentle to the patient, as well as reducing the stress and strain on our bodies from performing the adjustment. This is the standard “old school” approach to chiropractic adjusting. Adjustments are made by moving the spine into the right position and applying a very fast but short thrust to adjust specific segments of the spine. Often times, this type of adjustment produces a “cavitation,” that popping or cracking sound that many associate with chiropractic adjustments (which is more of a side effect than anything). It is important to note that not all successful adjustments produce a cavitation, and not all cavitations are good … but more on that later. Occasionally, we use two instruments to assist with adjustments: the Arthrostim, and the Vibrocussor. 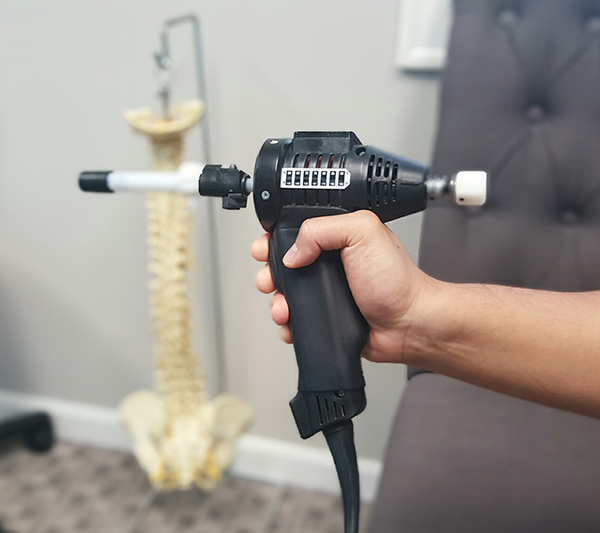 The arthrostim produces quick bursts of repetitive tapping that when applied to the spine can help adjust the vertebrae, as well as stimulate the nervous system in effort to help restore normal function to that area of the body. The vibrocussor produces both vibration and percussion and feels like a massager. It is designed to relax muscles and stimulate the nervous system in effort to help restore normal function to that particular area. Additionally, Dr. Lee is certified and rated as Advanced Proficiency in the Activator Technique. Activator Technique involves a hand-held mechanical instrument called the Activator Adjusting Instrument, and it provides swift, low-force impulse at specific points. The skull is often thought of as one solid mass of bone, when in fact, there are several plates of bone connected together that form the skull. Although the joints between these bones are nearly fused, there is some movement between them and they can be adjusted. Cranial adjusting does not produce any cavitation (popping), but can help restore normal function to the nervous system. We adjust extremities (ankles, wrists, elbows, knees etc…) but not all chiropractors do! This can help with specific problems in the extremities, and is similar in application to diversified adjustments of the spine. We particularly enjoying working with wrists and ankles/feet. WE LOVE KIDS! … and they need chiropractic, too! Many problems we see in the adult population were first caused in childhood. We often find ourselves telling our adult patients that if they had first seen a chiropractor 10, 20, 30 years ago, they may not have the problems they are experiencing today. This is why it is so important to have children checked for problems with their spine. Often, small problems with the spine can produce no symptoms, or can appear “normal” to a child, but if left uncorrected can slowly degenerate over time turning a small problem into a big problem by the time the child becomes an adult. Make no mistake, children are different from adults, and therefore are adjusted differently than adults (no twisting, crunching, or popping when performed correctly). Children as young as a few hours old can have their spine checked for problems. Not all children will need adjusting, but all children should be checked! Making sure your child has a healthy spine can set them up for a lifetime of good health!